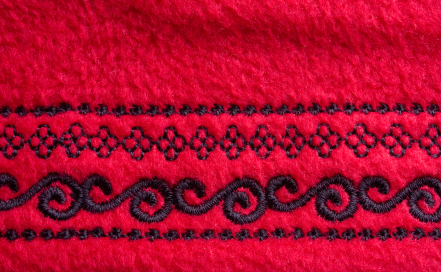 The Uses of Garment Decoration » Embroidery Talk Has Moved! Whether you c all it flash, bling, sparkle, embroidery, sublimation, personalization, or any number of other names, the fact is that decoration on clothing has been and most likely always will be popular. From a discreet monogram on the cuff of a dress shirt to the full on sparkle of a rhinestone design, people love wearing clothing and carrying items that have been decorated in some way. I suppose that’s not really surprising. Decorated clothing or associated items can have a lot of uses. Decoration Unifies. There’s a reason that teams all wear matching shirts and jackets or carry bags monogrammed with the team name. It’s the same reason that’s behind corporate logowear and the servers in your favorite restaurant all wearing the same shirt. Dressing everyone alike provides a sense of unity. It also allows team members to be easily identified. Decoration Adds Drama. Everyone notices the bra with the bling and the shirt with the sparkle. Carrying an awesome sublimated tote bag or wearing an amazing embroidered shirt will draw attention. A well decorated garment can be like a work of art. Decoration Personalizes. There’s a reason people monogram everything from sheets to towels to shirt cuffs. Personalization takes something that could be one of many and makes it unique. It could be a name embroidered on a backpack or your monogram on a set of towels, but the decoration makes the item that much more yours. Decoration Proclaims Allegiance. We don’t just pledge allegiance to the flag, many of us wear it proudly on decorated garments. People will wear sports jerseys with the names and numbers of their favorite players or a rhinestone shirts that proclaims they are hockey moms or dads. A decorated garment allows you to tell the world what you like and what you support without you having to say a word. Decoration Elevates the Boring. Blank is blah. Adding a decorative border, a picture or a saying can elevate a garment from flat to fantastic. While it’s probably true that not every garment needs to be decorated, it is also true that decoration can add more interest to the garment and to the outfit of which it is a part. This entry was posted on Wednesday, February 8th, 2012 at 10:53 am and is filed under Garment Decoration. You can follow any responses to this entry through the RSS 2.0 feed. Both comments and pings are currently closed.